For years now, I've had the softest spot in my heart for New Heaven, ahem, Haven, Connecticut. It's a little rough around the edges, but in the center, it's filled with glorious Gothic architecture, my favorite manageable museum, the Yale Center for British Art, a pack of the most fun and talented guys I've met in eons and some of the best food to ever touch my lips. Frankly, it's a lot like a cheese croquette. Jason "The Big Cheese" Sobocinski - one of those fun and talented guys - owns Caseus, the least healthy and most delicious cheese-based restaurant and shop in the Northeastern U.S. And in great news for all Nutmeggers, he's now whipping up his own creamy concoctions in his newest venture, The Mystic Cheese Company. In search of the great white whale he's named his first fermented, curdy offering, Melville. 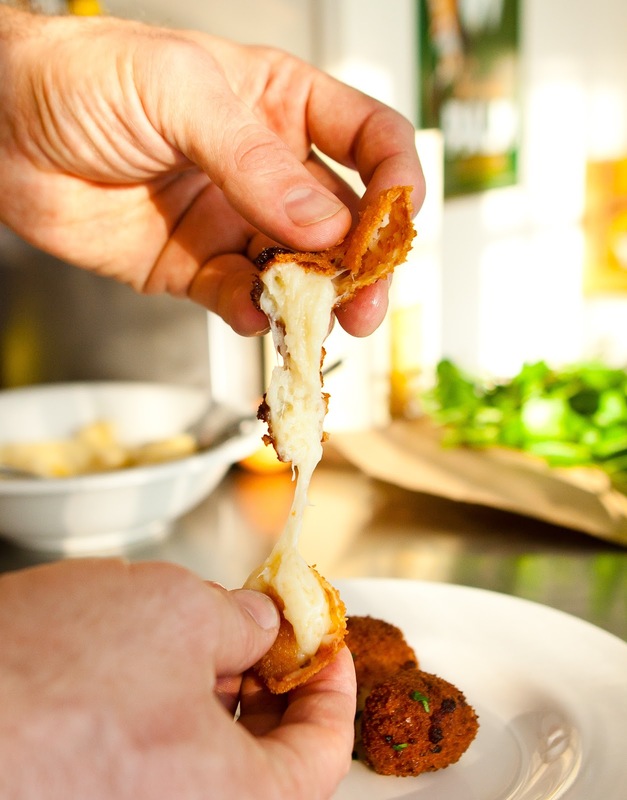 This insanely rich & buttery cheese works perfectly with a simple croquette recipe. If you can't find Melville, as it's just coming out in CT at select artisan cheese retailers, try a super runny robiola instead. In a small sauté pan over medium heat melt the butter and add the 4 tbsp of flour. Stir to combine and add in the ripe Melville. Stir to combine and add the pinch of chili flakes and just a bit of kosher salt & fresh cracked pepper. Remove the mixture from the pan and into a bowl and allow to cool in the fridge until firmed up. Cover the mixture with plastic wrap to hold it. This can be done a day ahead. Heat the oil in a deep pan or sauce pot to 350 degrees. 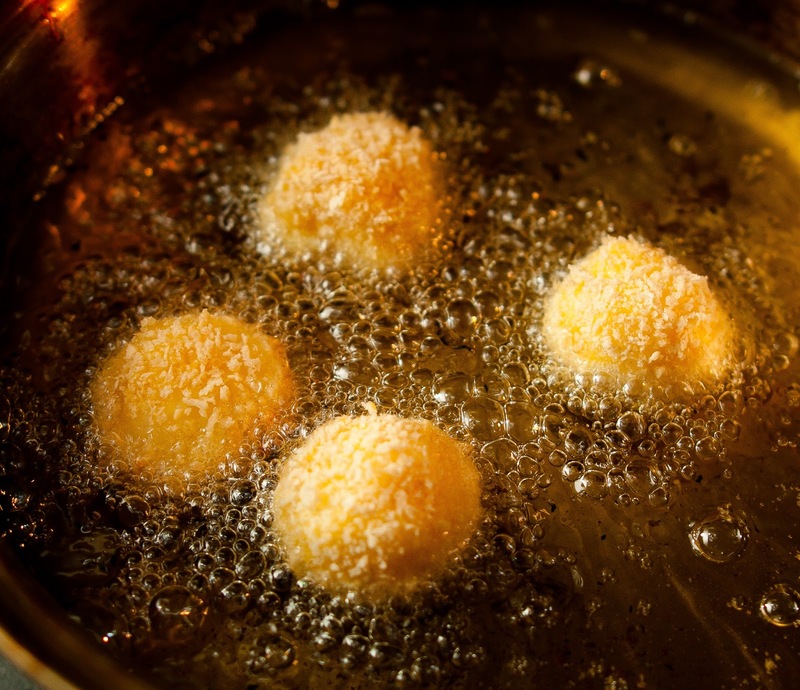 Using three small bowls place the 1 cup of flour, the 1 cup of panko and the beaten eggs into each bowl individually. Using a teaspoon scoop out about an inch sized ball of the cooled and firmed Melville, flour, butter mixture. Roll with your hand to create a nice ball. First dredge in the flour, then the beaten egg and last into the panko. 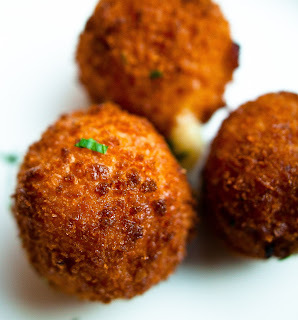 When all of the mixture is made into balls and coated with the flour, egg and panko you are ready to fry. Place one at a time into the preheated oil and allow to fry for 1-2 minutes or until they are a deep golden brown and crisp. Allow them to cool slightly on a paper towel to drain or metal rack. Garnish with sea salt & any fresh herb of your choice. Best Served with a dry Prosecco & fresh apple slices and a few friends. I Hollister how decadent. Could I eat just one? I don't think so!! Aw the sight of those yummy thing makes me crave to have this in my table. Saving the recipe! :) Got my eye on your next posts.